WASHINGTON ― In 2008, Nujood Ali’s family forced her to marry an abusive man three times her age. That April, the 10-year-old Yemeni girl traveled alone to a courthouse and demanded a divorce. A pioneering lawyer took on her case. A judge accepted the petition. International media took note, and Ali became a global hero who seemed poised to move past her repressive, impoverished background. That November, Glamour Magazine invited Ali and her lawyer to visit New York City to accept an award. That’s when Ali met Hillary Clinton. On stage at Carnegie Hall, receiving her “Glamour Woman of the Year Award,” Clinton joked about pantsuits. When Ali walked up to accept her own prize, the visibly excited 10-year-old stood beside her attorney, looked down at the ground often and occasionally offered a gleaming smile to an audience that included Tyra Banks, Michael Bloomberg and Jane Goodall. “I hope that when I return to Yemen, I will learn the law and I will learn English, in order to return here to study and work for a new future for all children and all humanity,” Ali said. Then Katie Couric handed her an award. Eight years after that meeting, observers from Teen Vogue to Daily Kos tout Clinton’s emails about Ali as evidence of the deep compassion they say she doesn’t get enough credit for. One message in particular has been shared widely on social media: a note that Clinton privately sent an aide nine months after her meeting with Ali, asking about ways to help the Yemeni girl further. “I hope there’s something we can do,” the then-secretary of state wrote. 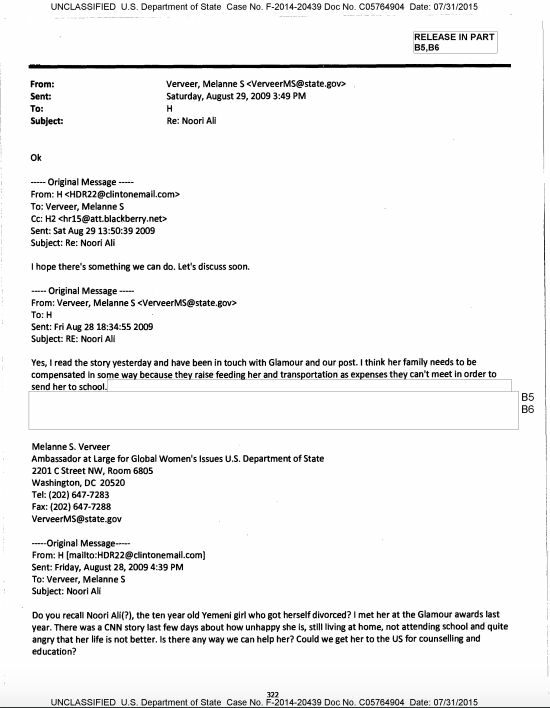 She was happy to hear an update on Ali’s situation a few days later, another email shows. Clinton’s fans see her continued commitment to Ali as evidence for their narrative. Clinton made it a point to meet Ali again, two years after the emails, when she visited Yemen. Her schedule from a seven-hour-trip to the capital, Sanaa, includes 15 minutes promised to “activists dedicated to ending child marriage” ― namely Ali and her lawyer, Shada Nasser. Nasser said she’s still impressed by that moment, and proud to have been part of it. Clinton was to address a conference hall filled with hundreds of people, including the biggest names in Yemeni activism, right after their meeting, “but the first people who met her were Nujood and I,” Nasser told HuffPost. Ali’s life improved rapidly after her high-profile divorce. Press coverage, Nasser’s advocacy and support from well-wishers ensured she was comfortably re-settled with her parents and returned to school months before she met Clinton. “I want to be an example for all the other girls,” she told the Los Angeles Times in June 2008. Nasser was optimistic about Ali’s future when the pair traveled to New York for the Glamour Awards. But in their meeting with Clinton, the lawyer said Ali still needed one big favor that the influential American could provide: She had to leave Yemen, and ideally live somewhere away from her family. “Her family don’t help her. They only try to abuse her,” Nasser explained to Clinton. Shada Nasser, Nujood Ali and Katie Couric at the Glamour Awards in 2008. Ali stayed in Yemen, however; the L.A. Times reported that she likely wanted to live with her parents because of her relationship with her younger sister. In August of 2009, Ali told a CNN team that she was furious that her international prominence had not translated to material improvements in her life. She was skipping school in her rage. That segment prompted Clinton’s now-widely shared email asking for Melanne Verveer, her ambassador-at-large for global women’s issues, to check in. Verveer reported that Minoui was paying for Ali’s school fees (something she confirmed to HuffPost, saying it was part of an advance from her publisher) and that Glamour was supporting an initiative to help other underprivileged Yemeni girls. The money wasn’t the trouble, the women around Ali say. They believe her thinking was warped because of her family’s demands and overly high expectations about what her celebrity meant. Filmmaker Khadija al-Salami, a fellow former child bride who directed a film featuring Ali’s story and other cases, recalled similar conversations. She had reached out to the girl after reading about her story in the Yemeni news, and she said she personally supported Ali’s school fees for some time. “The problem with Nujood is she became so stubborn … her sister went to school and she was absent from school. I would call and say, ‘Why are you not going to school?’ She would say, ‘Yes, yes, aunty.’ I would tell her, ‘You’re not going anywhere without education.’ I think the environment, her family and everything, it did not help much,” al-Salami told HuffPost. Still, Ali remained interested in the powerful women she had come to know, regularly speaking of Nasser and Clinton as role models, according to Minoui. 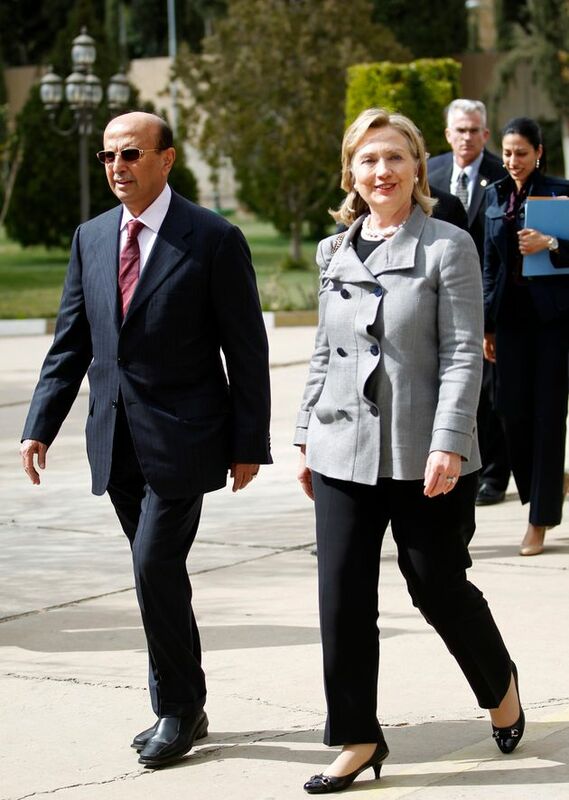 Hillary Clinton with Yemen’s then-foreign minister during her visit to the country’s capital, Sanaa, in 2011. She was the first secretary of state to visit the country in 20 years. The following month, Clinton praised the two Yemeni women in an essay for Glamour, calling Ali one of her heroes and saying she was enrolled in school. “When I first met Nujood and Shada two years ago, I was struck by their courage and by the power of their inspiring story. It seems I wasn’t the only one. These young women have brought hope to those suffering inside forced marriages. They have raised awareness of the emotional, psychological, educational, economic and even physical dangers of marrying too early in life. And they have inspired so many of us to redouble our efforts to protect young girls like Nujood,” she wrote. Minoui and Nasser believe that Clinton’s interest in Ali mattered a great deal, regardless of the way Ali’s journey turned out. The secretary kept the issue of child marriage in the news, and her family’s Clinton Foundation continues to combat it internationally. “She didn’t need to look for the little girl when she went to Sanaa,” the French reporter noted. Ali never finished her education. She is now almost 19. (Estimates of her age vary, and she says she is not sure of it herself.) She has had to battle her father for some of the money owed to her from the royalties of the book and for possession of the home the French publisher bought for her. Her father still lives in the house, and he has used some of Ali’s money to marry a third wife. In 2014, Ali remarried. She now has two daughters of her own. Today, Ali’s family is enduring a fresh challenge ― one Clinton could play a major role in solving. Like millions of Yemenis, they are caught in the war between a Saudi-led coalition trying to restore the country’s government and Iran-backed rebels who want to change it. The U.S. is playing a major role in the conflict, refueling coalition jets that have been linked to multiple reports of war crimes. The Obama administration claims it is reviewing its support for the coalition, but its confused line on the war seems mostly about deflecting criticism over it until a new president decides which course the U.S. should take. Ali traveled to Saudi Arabia for treatment last year after she developed tuberculosis, Nasser said. She is now back in Yemen, where medical supplies and food are running low as daily airstrikes damage infrastructure. Clinton, Ali says, will fix her country’s woes. “The moment I heard that she would be nominated as U.S. president, I thought things would definitely improve in Yemen. For sure,” she said. Nasser shares Ali’s optimism, saying the U.S. can easily exert pressure on the Saudis to end their bombing and dismissing the idea that Clinton may go easy on them given her belief in supporting traditional U.S. alliances. “The White House is the White House,” she said. The lawyer, an icon in Yemen, thinks Americans, particularly women, must vote for Clinton because of her accomplishments and her potential to inspire girls around the world. For Ali, a President Clinton means a more peaceful life.